My name is Lima, and I must confess: I'm a glitterholic. If you ever have the privilege of browsing around my dressing table, you'll notice a huge big box full to the brim of glitter hidden underneath it. And in that box you will find all types of glitter: finely milled, chunky, hexagons, squares, stars - you name it, I got it. But despite having all this glitter, I feel that I don't quite use it as much as I should. At the rate I'm going, in 10 years time, I'm still gonna have most of the glitter I have right now, plus the copious amounts I'll no doubt purchase along the way! I woke up one morning determined to make use of it, but lacking in inspiration. So I opened up Pinterest and saw a whole stream full of photos of amazing eye looks created using sequins. Sequins are probably the one thing I don't have in my glitter box, but I was inspired nonetheless, and attempted to create my own take on it with some of my chunkier glitter. To achieve this was remarkably simple. I applied my eyeliner and winged it out just as I would every morning, although as I knew it would be covered up glitter, there was less pressure to get it nailed on perfect. I wasn't looking to cover the entire liner in glitter, just the inner section, as I was going for a graphic liner look, so I took out my Lit Cosmetics' Clearly Liquid Glitter Base and applied it with a brush to edges of my liner. The aim here was to get the glitter as close to my lash line as possible, so some care and precision was required! Now, I used the same brush to pick up some of my glitter, and dab it on to the Glitter Base, working my way all around the liner to ensure full coverage. For Eid I also wore glitter eyeliner, but did something a little different. 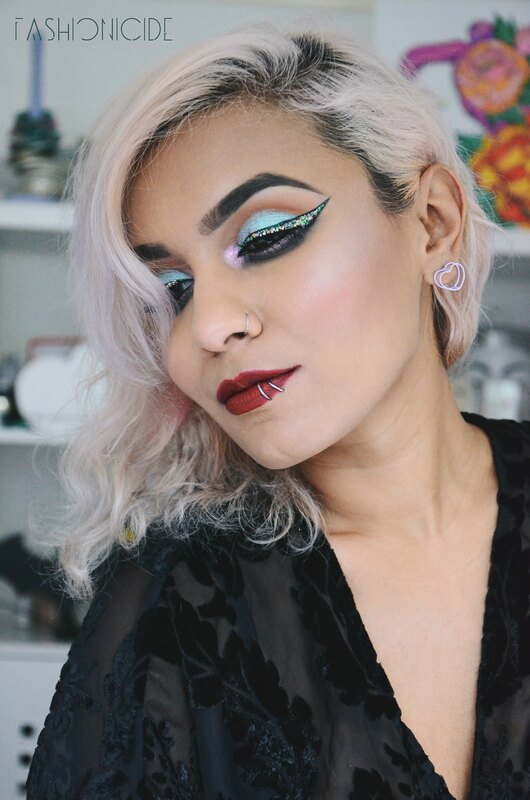 I applied my liner in the style of my favourite 1960s Edie Sedgwick eyeliner look, with the liner brought into the crease which gives the appearance of a curved frame around the lid - something about it just oozes style. This time, I applied the Glitter directly over the top of the liner, to give the effect of an actual glitter eyeliner. The results were mesmerising, and certainly fit for my Eid celebrations! This technique of covering the liner entirely in glitter is also pretty useful if you think that you aren't great at getting your lines spot on - the glitter hides imperfect application, and lets you dazzle instead! 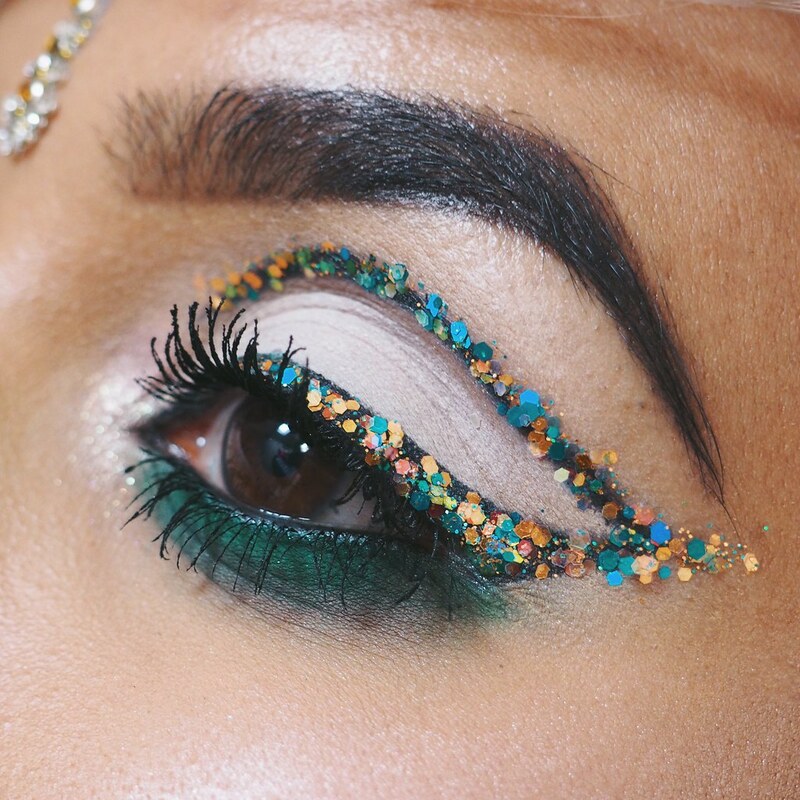 I love that chunky Glitter Eyeliner gives the appearance that your eyes have been adorned and embellished, and from afar it even looks almost as if they are sequinned. The eye area truly sparkles, and brings a new dimension to your makeup look - the possibilities are truly endless, and thanks to the likes of Lit Cosmetics and Lime Crime bringing out excellent quality cosmetic glitter glues, it's so, so much easier to create something special. I love glitter. And you wear it so well! I really enjoy seeing all the great eye makeup looks you create. P.S. Those earrings are cute! You constantly inspire me and I'm always really envious of how beautiful, creative and skilled you are! This looks absolutely amazing and I might even one day try (and badly fail) to create this for myself. Wow, and you did this by yourself? I almost cannot believe it! Your make-up looks like straight out of a magazine, and don't try to tell me it's simple. 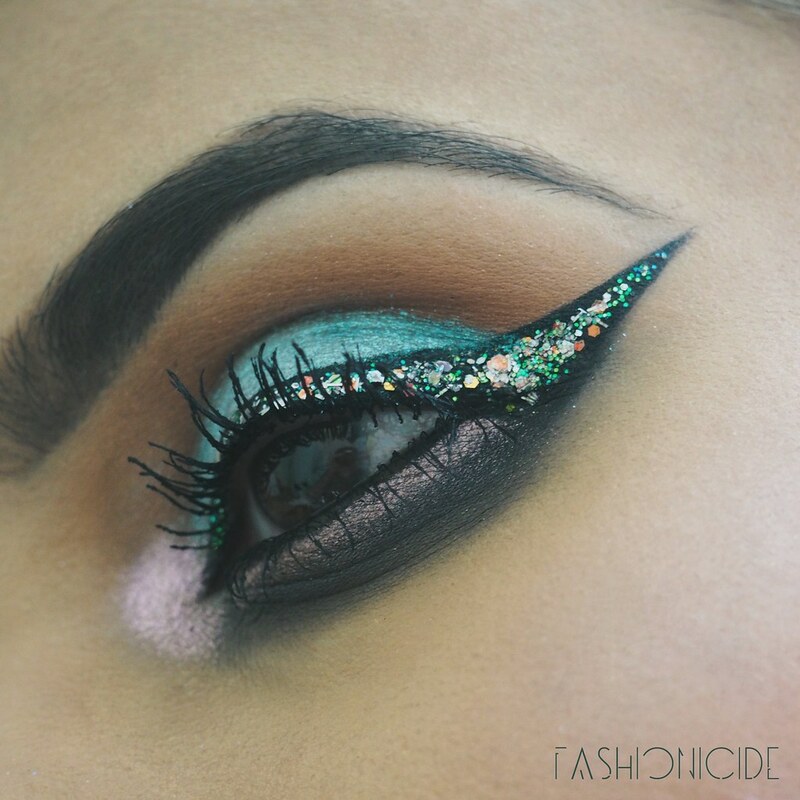 I am not really a glitter fan, but this make-up would be great for the NYE party! 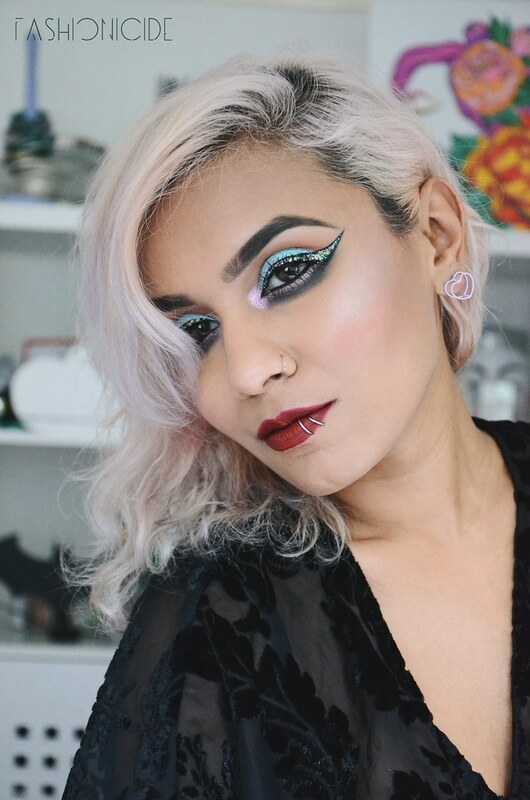 Forever in awe of your beauty skills - the eye makeup looks incredible, so bold and striking! More than anything I adore the teal shade underneath your lower lashes. Perfect.